Take our word for it, folks: good vision support products are not just about lutein and zeaxanthin. You need hefty doses of Vitamin A, Vitamin C, and omega-3 fatty acids to name a few. Wait a minute. One product quickly comes to mind. Enter Irwin Naturals Vision Sharp. It seems to us the manufacturer is determined to boost your eye health like no other product could. Impressive ingredient profile. Goes above and beyond the usual vision support ingredients. Extra health benefits. Omega-3 fatty acid content helps boost heart health as well. Good reputation. Customers have given it high marks online. Other Ingredients: Gelatin, purified water, soy lecithin, glycerin, beeswax, silicon dioxide, titanium dioxide and sodium copper chlorophyllin. DIRECTIONS: (Adult) Take two (2) Liquid Soft-Gels a day with a meal and a full glass of water. If you’re young, you may be taking your eye health for granted. It doesn’t matter if you’re into bodybuilding or not. Too much computer time (no thanks to social media and the like), inadequate Vitamin A intake, and insufficient eye rest can all take a toll. The takeaway: don’t wait until you get old before you start making your eye health a priority. Good thing there are vision products such as Jarrow Formulas Vision Optimizer which can help you. We gave it an outstanding grade. We hope other related supplements can follow suit. Let’s see if Irwin Naturals Vision Sharp is up to the task, folks. The manufacturer dubs it its “Multi-Nutrient Eye Health” product, per its official website. It’s also a “Powerful Daily Protection to Support and Maintain Healthy Visual Function,” per the same source. We like it. The more a product covers the bases, the better. 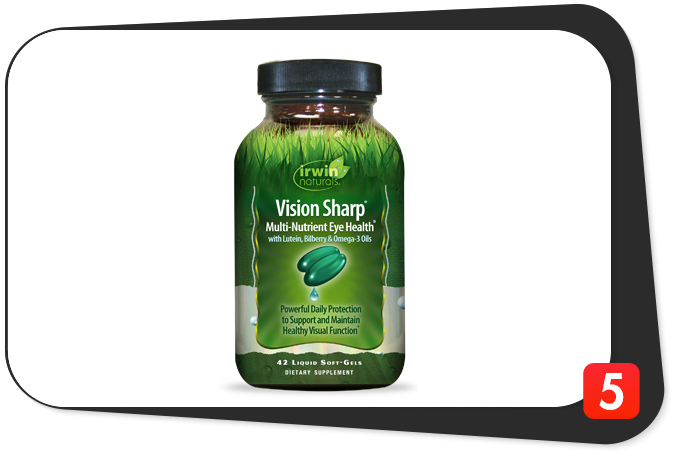 Try boosting your eye health with a potent vision support product such as Irwin Naturals Vision Sharp. The manufacturer’s stance on eye health is similar to ours. “Taking a proactive path toward slowing the compounding effects of age-related vision changes is the best way to enhance a keen sense of sight,” per its official website. “This combination of vision-specific minerals, botanicals and powerful antioxidants helps to protect and support eye tissue as you age,” per the same source. Now, don’t get the idea Irwin Naturals Vision Sharp is intended solely for older folks. So, anybody 18 years of age and older can take Irwin Naturals Vision Sharp. Tissue-Supporting Materials: Irwin Naturals Vision Sharp has the minerals manganese and zinc which strengthen connective tissues the and vascular system in your eyes. Vision-Specific Antioxidants: Many vision support products include a heap of antioxidants to protect the eyes. Here, you can find the usual ingredient staples beta carotene, lutein, and zeaxanthin. Botanical Support: Take a hint from the name, folks. These are plant-based ingredients which support long-term eye health. More specifically, these are bilberry extract and gingko extract. Irwin Naturals Vision Sharp’s main ingredient is 1.010 grams of fish oil (30 percent omega-3 fatty acids) per serving (two liquid soft gels). Dr. Lois Smith, professor of opthalmology at Harvard Medical School, Chilrdren’s Hospital Boston (via the National Eye Institute’s official website), says omega-3 fatty acids found in fish and supplements may ward off abnormal blood vessel growth in the eyes. These fatty acids may also help keep macular degeneration at bay, per the same source. The folks at Irwin Naturals stress this product’s added dose of omega-3 fatty acids aims to boost long-term health, not just eye health. Bona fide health freaks know omega-3 fatty acids are great for your heart. Just ask the American Heart Association. We think the extra health benefits are awesome. Any time a supplement has bonus ingredients which shore up long-term health, it’s a game changer. We already told you manganese (two milligrams per serving) and zinc (15 milligrams per serving) lead the charge for the Tissue-Supporting Mineral ingredient group. At 100 percent of the daily value (anything more than 15 percent of the daily value is high), Irwin Naturals Vision Sharp’s manganese content boosts not only eye health, but your overall fitness levels as well. As for its zinc component, it helps ward off age-related macular degeneration, per the American Optometric Association. Since the body does not produce enough zinc, sufficient intake through food and supplements will help immensely. This product’s solid 100 percent of the daily value for zinc will certainly shore up your eye health, folks. Next up are the Vision-Specific Antioxidants ingredient group. Here, the carotenoids (pigments which give fruits and vegetables their bright-colored hues) are the stars of the show. Leading the charge is a whopping 28,666 IU of Vitamin A (100 percent as beta carotene) per serving. To put things in perspective, that is equal to an amazing 573 percent of the daily value for Vitamin A.
There’s a good chance your grade school science teacher taught you the importance of this vitamin for the eyes. We’re glad Irwin Naturals Vision Sharp has this ingredient. This supplement also has 400 milligrams of Vitamin C per serving (equal to 667 percent of the daily value). Do not underestimate what ascorbic acid can do for your eyes. While this vitamin is known for its ability to ward off the common cold, it also acts as a potent antioxidant which regulates eye blood vessel health. Irwin Naturals Sharp has a ton of Vitamin C. When you take this supplement, your eye blood vessel health will improve. Trust us. This product also has 120 IU of Vitamin E per serving (equal to 400 percent of the daily value). Vitamin E is a common vision supplement ingredient. Rightfully so – experts say is the most potent fat-soluble antioxidant. Because of that, it protects your eyes against cataracts and age-related macular degeneration and improves lens clarity. We’re stoked this versatile eye health ingredient is in Irwin Naturals Vision Sharp. Another key antioxidant is the carotenoid lutein, a staple vision product ingredient. This supplement has 10 milligrams of lutein per serving. This ingredient helps negate the effects of too much sun exposure and poor nutrition – two factors which are detrimental to eye health. We believe 10 milligrams per serving is optimal. The aforementioned Jarrow Formulas Vision Optimizer has the same amount. The final key antioxidant in Irwin Naturals Vision Sharp is two milligrams of zeaxanthin per serving. This is a component of the macula which helps filter out sunlight. In other words, zeaxanthin helps protect your eyes from direct sun exposure. Think of it as another layer of eye protection aside from your sunglasses. Two milligrams per serving should go a long way. Again, Jarrow Formulas Vision Optimizer has the same amount. Next up is the Botanical Support ingredient group which provides your eyes with plant-based protection. This product has 320 milligrams of bilberry extract per serving. The manufacturer says the British Royal Air Force pilots’ use of bilberry for eye health in World War II caught the attention of many. The result: these pilots said their night vision improved drastically. Bilberry extract’s antioxidant compound content was the root cause. As for Irwin Naturals Vision Sharp’s 120 milligrams of gingko extract per serving, the company says it “enhances vascular circulation,” per its official website. Finally, this supplement has 38 milligrams of citrus bioflavonoids per serving. Bioflavonoids help boost eye health because they can ward off inflammation and have impressive anti-bacterial properties. We feel the 38 milligrams of citrus bioflavonoids per serving serves as a great insurance policy. In a nutshell, Irwin Naturals Vision Sharp’s has an impressive nutrient profile which will help improve your ocular health over the long haul. Vitamin A (100 percent as beta carotene), 28,666 IU: Irwin Naturals Vision Sharp is a tremendous source of Vitamin A at a whopping 573 percent of the daily value. Beta carotene is an important nutrient for eye health. Expect it to improve dramatically when you take this supplement, folks. Vitamin C (as ascorbic acid), 400 mg: This vitamin is the unsung hero in terms of ocular health. It has potent antioxidant properties which regulate eye blood vessel health. This product’s incredible 667 percent of the daily value for ascorbic will make a difference. Make no mistake about it. Vitamin E (as d-alpha tocopherol), 120 IU: The body’s most potent fat-soluble antioxidant which helps keep age-related macular degeneration and cataracts at bay. Irwin Naturals Vision Sharp’s awesome 400 percent of the daily value for Vitamin E is powerful stuff, folks. Zinc (as zinc oxide), 15 mg: This product’s 100 percent of the daily value for this mineral should help ward off age-related macular degeneration. Trust us. Manganese (as manganese aspartate), 2 mg: An important mineral for optimal ocular function. It also has several important benefits for long-term health. Fish oil (30 percent omega-3 fatty acids), 1,010 mg: This ingredient is imperative for healthy eye blood vessel growth. It also helps ward off macular degeneration. Not only that, omega-3 fatty acids are necessary for cardiovascular health. We believe more than one gram per serving will go a long way. Bilberry extract (25 percent anthocyanidins)(fruit), 320 mg: British Air Force pilots during World War II reaped the benefits of bilberry. We’re confident you will experience better night vision like they did. Gingko extract (24 percent flavone glycosides, 6 percent terpene lactones)(leaf), 120 mg: The manufacturer claims this component “enhances vascular circulation.” We’ll take its word for it. Citrus (Citrus spp.) bioflavonoids (80 percent bioflavonoids)(fruit), 38 mg: This is a great inclusion because of its ability to keep inflammation and bacteria at bay. Thirty-eight milligrams per serving ought to suffice. Lutein, 10 mg: A time-tested vision support ingredient which helps offset the nasty effects of sun overexposure and poor nutrition on the eyes. It’s a virtual must your vision supplement has this. Zeaxanthin, 2 mg: The retina’s macula component which helps filter out sunlight for optimum eye health. Just like lutein, zeaxanthin is another staple ingredient among vision support supplements. BioPerine black pepper extract (95 percent piperine)(fruit): A popular bodybuilding supplement ingredient which facilitates digestion and nutrient uptake. Ginger extract (five percent gingerols)(rhizome): Another ingredient which helps boost digestion and absorption for better results. Ginger extract also helps boost the immune system and ward off inflammation. A great all-around bonus, if you ask us. The manufacturer dubs Irwin Naturals Vision Sharp the “Multi-Nutrient Eye Health” for “powerful daily protection to support and maintain healthy visual function,” per its official website. After a thorough analysis, we say this claim is legit. Hey, the ingredients speak for themselves, folks. You saw the mega doses of Vitamin A, Vitamin C, Vitamin E, zinc, and manganese. We also think the inclusions of fish oil, bilberry extract, gingko extract, citrus bioflavonoids, lutein, and zeaxanthin are awesome. When you combine all of their powerful benefits, your vision will improve drastically. Some experts believe too much Vitamin A may increase free radical levels and the risk of osteoporosis. On the other hand, they also maintain mega doses of Vitamin C (something like 10,000 milligrams per serving) are detrimental to eye health – they may increase the risks of retinal detachment, macular degeneration, cellophane maculopathy, and the like. Our take: you won’t jeopardize your health as long as you follow the manufacturer’s prescribed dosage. Never go overboard. Combine that with regular exercise, sound nutrition, and ample rest, you should be fine. On the flip side, one of the major letdowns was the inclusion of a proprietary blend (BioPerine Complex). The manufacturer failed to divulge the exact ingredient amounts of BioPerine black pepper extract and ginger extract. Nonetheless, this BioPerine Complex should help speed up and regulate the absorption of Irwin Naturals Vision Sharp’s ingredients for better results. Finally, this product “contains a chemical known to the state of California to cause birth defects or other reproductive harm,” per its label. Obviously, pregnant women should steer clear of Irwin Naturals Vision Sharp. Irwin Naturals Vision Sharp “is much more than just lutein or antioxidants” as it “combines a complete blend of minerals, botanicals, and antioxidants for total eye health support,” per its official website. We agree with these claims. You can see for yourself Irwin Naturals Vision Sharp has the complete arsenal in terms of long-term and optimal ocular health. Irwin Naturals Vision Sharp is intended for healthy individuals over the age of 18 who want to improve long-term vision, improve general wellness, and achieve their daily fitness goals. Irwin Naturals Vision Sharp has high doses of Vitamin A and Vitamin C, which may result in some side effects, like we mentioned. If these, or any other ingredient, makes you feel doubtful, please consult your physician before purchasing. Great ingredient combo. Vitamin A, Vitamin C, Vitamin E, manganese, zinc, omega-3 fatty acids, bilberry, gingko, citrus, lutein, and zeaxanthin. Bonus health benefits. Omega-3 fatty acids for heart health and Vitamin C for protection against the common cold. Has lutein and zeaxanthin. Two vision support ingredient staples. Has bilberry extract. Helps improve night vision. Good reputation. Consumers have given it high marks online. Proprietary blend. BioPerine Complex does not divulge individual ingredient amounts. Boo. Undisclosed dirty ingredient. Detrimental to pregnant women, per the label. Like we said, Irwin Naturals Vision Sharp pulls out all the stops in terms of eye health. We love this all-out approach and the comprehensive ingredient profile. They bode well for optimal ocular function. Clearly, this product has a few cons. However, they are not big enough to overcome its pros. We recommend you try (and eventually buy) Irwin Naturals Vision Sharp. Your eyes are sure to reap its impressive benefits.